Capacity and design: This Wine Enthusiast Classic L 80-Bottle is a timeless model in the popular Wine Enthusiast Classic L Wine Cellars series. Standing at a height of less than 3 ½ tall, this Wine Enthusiast Classic L 80-Bottle has an impressive storage capacity. You can store at least six dozen of your collection in this free-standing 80-bottle unit. Compressor cooling and ETL. This Wine Enthusiast unit has an advanced compressor-cooling system. You get a consistent temperature with this cooler. This classic unit is ETL-certified energy efficient – helps to reduce energy consumption. Install this Wine Enthusiast Classic L unit on a solid and even floor. Use the included leveling legs to correct any unevenness. Choose the placement of your cooler away from direct heat, e.g. cooktops, ovens, heaters. This Wine Enthusiast model is for free-standing installation only. Rear venting. It has the classic finished black exterior and a black tubular steel door handle. This elegant appearance complements both classic and modern design elements. This Wine Enthusiast unit has stainless steel frame, UV tinted triple-paned glass door and wood-trimmed shelf facings. Single zone This Wine Enthusiast Classic L 80-bottle is a single-zone model. It has a wide temperature range of 40°F – 68°F. An advantage of a single-zone is a simple thermostat management – you only need to set one temperature. In general, you get more a consistent set temperature with a single zone. If you collection is predominately red wines, set it between 50°F – 60°F. If your vintages are primarily white, set the temperature between 40°F – 50° F. If you are storing equal numbers of reds and whites, set your temperature between 53°F – 57°F. Digital temperature control. This Wine Enthusiast unit has a digital temperature control. It is super easy to operate. The + button is to increase the temperature, the – button is to decrease the temperature. Your set temperature is clearly displayed on the control panel. This control panel also has an icon to manage the interior light, another icon to turn the power on or off. Interior LED light. 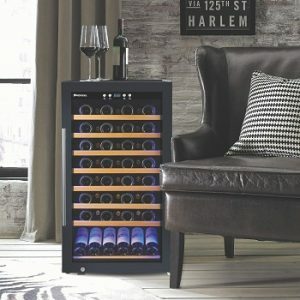 This Wine Enthusiast 80-bottle unit has beautiful interior lighting. They are blue LED lights illuminating from the sides of the wine cooler. The LED lights allow you to view your inventory quickly, and display your collections in beautiful ambiance. You can turn on or off the LED light via the control panel. Accessible shelving: This Wine Enthusiast classic L wine cooler features black wire shelving and beautiful wood-trimmed shelf-facings. It features seven sliding racks and a bottom shelf. The shelves slide-out half-way, 50% of the length of the shelves. An advantage of the black wire shelves – you can see your collections easily. When you are viewing from the front of the unit, the wooden trimmed facing is especially attractive. The natural wood provides an organic element to complement the black-framed glass door and the interior blue LED lights. Tips: When you want to remove a shelf, you want to have an empty shelf first. Remember to pull out just one shelf at a time. First, remove all bottles on the shelf. Next, slide or pull the shelf out as far as it will go. Then lift the shelf up and off the sides. Non-reversible Door: This Wine Enthusiast classic model does not have a reversible door. It has a right-hinged door. Check your space configuration – make sure the door swing direction meets your needs. The door handle is made of beautiful black tubular steel. Security lock: This Wine Enthusiast Classic L 80-bottle has a lock at the front bottom of the door. It comes with two keys. Summary: This Wine Enthusiast Classic L 80-bottle wine cooler (View on Amazon) offers big capacity in a compact-size body (40.8 ” tall by 23.2 “wide x 24.8” Deep). Classic piano black exterior and rear venting – gives you an attractive profile of wood-shelf-facing, glass door with striking black frame. 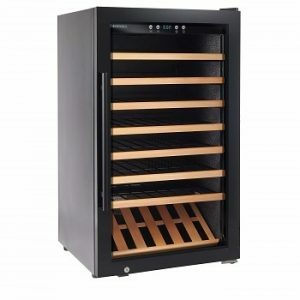 This free-standing-only wine cooler adds elegance and functionalities to any space. Classic never goes out of style. This classic model is also energy-efficient powered by an advanced compressor-cooling system. Beauty and functions – you get it all with this Wine Enthusiast classic model. 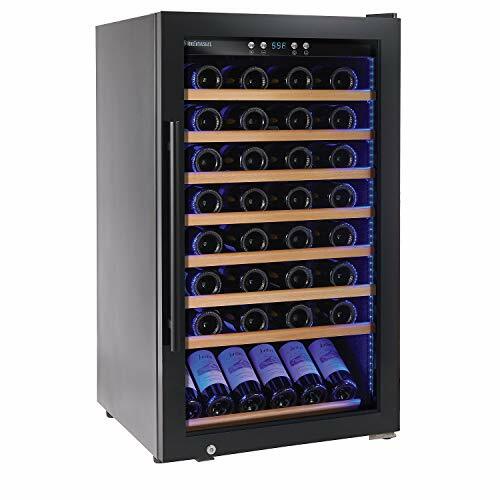 80-bottle, single-zone, black stainless steel frame, UV tinted triple-paned glass door, black-wire racks, wood-trimmed shelf facings. 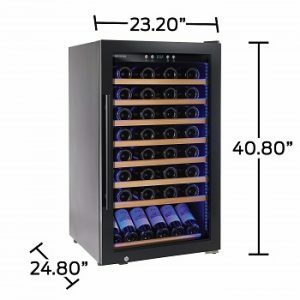 If you would like to consider a bigger capacity than 80-bottle, check out our featured list of 100-199-bottle wine coolers.